President Obama just stooped to a new low. 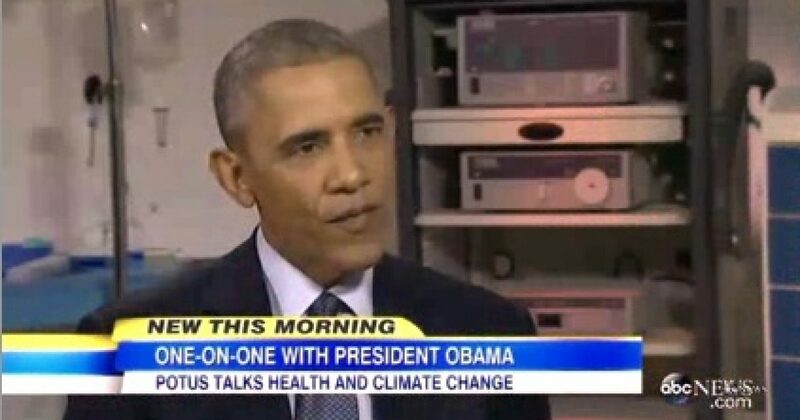 Obama is now claiming that climate change is a cause of health problems and during an interview on ABC News, the president emphasized the point by mentioning that an asthma attack when Malia was very young resulted in an emergency room visit. Besser, who met with the president yesterday at Howard University’s Health Sciences Simulation Lab, asked the president why people should care about the impact of climate change on public health when there are so many other pressing health problems. “Keep in mind that climate change is just one more example of how the environment will cause health problems, and I think most people understand that,” the president responded. Don’t be fooled by Obama’s shameless exploitation of Malia’s past illness. Linking climate change to heath issues, especially with children, is part of a communications plan to generate fear and public support for climate change regulations. An EPA strategy document discovered by a Freedom of Information Act (FOIA) request advised the agency to link climate change to adverse health effects in order to make the issue more relevant to Americans. I described EPA’s child exploitation effort in a Washington Times commentary. First, EPA Administrator Gina McCarthy used the agency’s new propaganda tactic on climate change and now Obama is shamelessly using his own daughter. This incident shows, once again, Obama will do anything to advance his radical agenda.